Do you have quite a small kitchen and feel constrained in your appliance and gadget purchases because of lack of counter and storage space? With the the KitchenAid Artisan Mini Series Tilt-Head Stand Mixer, that’s not going to be a problem. 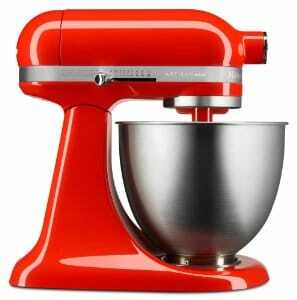 When it comes to stand alone mixers for baking and cooking, there is KitchenAid and everyone else. KitchenAid mixers are the Cadillacs of home mixers. They are incredibly powerful, reliable and many are still in use from the 60’s, which shows you just exactly how durable they are. It is one of the most recognized and cherished kitchen appliances ever made. One thing that can always be said about KitchenAid mixers is that they are big and heavy. While that isn’t a bad thing, mainly because they just don’t break, they are a bit difficult to store away when not in use. If you have a medium to large kitchen, we suggest buying a regular sized one. You can compare the Classic, Classic Plus and Artisan KitchenAids here. However, now you can finally own a smaller and lighter one and manage to find space for it while enjoying the multitude uses that it can provide in the kitchen with the KitchenAid Artisan Mini Series Tilt-Head Stand Mixer. It looks exactly like their regular sized models only it’s 20% smaller and 25% lighter. That makes it a lot easier to maneuver, which addresses one of the main complaints about full sized units being difficult to move around on a counter top and/or store in cabinets or cupboards when finished. Although the Mini is slightly smaller than the regular sized mixers, it comes with the same amount of power as the Classic KitchenAid Stand Mixer. They both have 250 watts, and that is enough to power all of the available attachments. You can mix dry and wet ingredients, make whipped cream and even make bread dough. The biggest difference is the smaller bowl, at only 3.5 quarts down from 4.5 quarts on the Classic and 5 quarts on the Artisan. The Artisan is also slightly more powerful than both the Mini and the Classic at 325 watts. That means you won’t be able to make single huge batches of cookies for any major people gatherings, church socials, birthday parties and such, but it will be more than adequate in a family setting (think 5 dozen cookies). Besides, if you really want to feed everyone, you can mix up another batch of batter while the first batch is cooking. But that’s what the Mini is all about, convenience. In most cases you’ll only need family sized portions, so instead of dragging out the big regular mixer, you can just pull out the Mini instead. Made with a steel case and very little plastic. Accessories included are a coated flat beater, a coated dough hook, a wire whisk and a 3.5-Qt. brushed stainless steel bowl. It comes with 10 speeds, just like the regular models. Except for full sized bowls and mixing blades, all of the other KitchenAid accessories will work on the power port. It comes in 10 different colors so you’ll always be able to match a color to your kitchen decor. 250 watts of power, just like the classic KitchenAid mixers. Damp wipe cleaning on the case and bowl holder. It’s a KitchenAid so it is going to be up to the task of virtually anything you want to mix. Don’t run it for too long at a time to avoid burning out the motor. If you are at all familiar with tilt-head mixers, you tilt it up to change blades and beaters and scrape ingredients back into the bowl, push the head back down into the bowl and turn it on. You may want to experiment with the speeds for best results, but it comes with a very comprehensive instruction booklet which will give you the speed and mixing basics for virtually every type of mixing you’ll ever care to do. The other attachments, like pasta rollers, food grinder, slicer and shredder, and juicer, will come with their own instructions to use with the KitchenAid. We review which attachments are most useful. Very well designed, just like the originals, and just as useful too. You’ll be able to use all of the regular KitchenAid accessories including the pasta maker, food processor, meat grinder and everything else. It has a very simple speed selection lever for all of the speeds between 1 and 10. The included recipe and instruction book are easy to read and understand, and it will give you the best speeds to use for any mixing task. The 3.5 quart bowl will be more then adequate for any family. Probably the best line of consumer mixers ever manufactured. This is not an inexpensive mixer, costing just a little bit less than the Classic mixer. But if you want the best, you’ll have to pay for it. It looks like a mini Artisan but is closer to the Classic in features. Eg., the lower power, the mixing bowl does not have a handle and there is no pouring shield. If you are always making large single batches of cookies, cupcakes or what have you, the 3.5 quart bowl may not suit your needs. The larger and heavier KitchenAid stand mixers virtually always stayed in place no matter how intense the mixing task is (think bread dough here). The Mini won’t be as stable, and may vibrate or move around on your counter top for these more intensive mixing chores. This is a quality product, and you’ll have to pay a goodly sum to have one in your kitchen. But if the larger and heavier KitchenAid mixers always seemed like a hassle to move around and store, the Mini is the answer. You’ll still get the same KitchenAid durability, the same power, the same use of the optional accessories, even the same warranty as the Classic, but it just comes in a smaller and lighter package. The Mini might not be right for the baker who makes larger quantities of baked goods, and I suppose you could always get another mixing bowl for that purpose, but most people only bake for their families anyway. And in that situation, this is going to be the best KitchenAid Mixer for the job. Be forewarned – splatter is more abundant, and the bowl is very narrow, making additions while motor is running dicey. Adding ingredients cleanly will require the stopping the motor, tilting, adding, restoring motor & restarting a necessity. There is no shield for this. I returned mine, got a Classic Plus instead. The taller & wider bowl makes it easier, as there is a shield available.